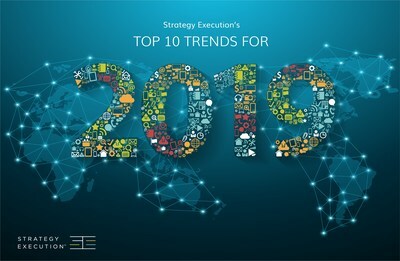 LONDON, Jan. 28, 2019 /PRNewswire/ -- TwentyEighty Strategy Execution, Inc., the global authority in corporate education and project leadership training, has released its Top 10 Trends for 2019. This year's trends reflect the growth of project-based work globally, in tandem with ever-changing technology and complexity within organisations and in the marketplace. To download a free copy of the 2019 trends, click here. "The nature of project management and leadership work is proliferating – not only geographically, but notably across roles and functions. Project-based work has expanded beyond just the PMO or IT department," said Christoffer Ellehuus, Strategy Execution's CEO. "We believe that successful execution of strategic projects only happens today when professionals and leaders have the right mix of business, technical, and people skills in combination with the right adaptive mindset," he continued. "These trends together reflect the fact that project work touches all parts of the business and even those who may not think of themselves as classical project managers must aim to develop an adaptive skill set to advance their careers while also moving their organisations forward." This year's trends highlight reasons why adaptive skill sets are increasingly in demand, and why project leaders at all levels of organisations across different industries should work to develop these holistic capabilities. Organisations will find that embracing– rather than resisting – the onslaught of AI and big data and learning how to find the "human difference" in their people will be the key to adapting to increased automation. Whether impacted by Brexit, U.S.-China trade tensions, or political divisiveness, no organisation today is insulated from what's happening globally. Having leaders with the right awareness and mindset to adapt to external changes is critical. It's hard to keep up with the emerging technological resources available to project teams today. But this migration is inevitable, so organisations should upskill their teams to move deftly across various platforms to increase workflow efficiency and collaboration. Agile has emerged from an IT methodology to one that can be applied throughout the organisation – even at the very top. We're seeing Agile emerge to the C-suite as executives realize how this mindset and practice can help organisations change and adapt their strategies more quickly. Due to the inevitability of change across all businesses, the responsibility of managing change can no longer be contained to the HR department. Increasingly, employees at all levels of the organisation are expected to develop the communication and leadership skills to be change agents. For a full copy of the 2019 trends, click here. Strategy Execution, the global authority in project leadership training, equips your people with the complete package of technical and leadership skills — the mindset, adaptability, and expertise to lead and execute projects in any context. With curricula in adaptive strategic execution, project management, business analysis, contract management, and more, Strategy Execution partners with your organisation to build skill sets and change mindsets. It's time to declare a new standard of performance. For more information, visit strategyex.co.uk. All references to "Strategy Execution" are to TwentyEighty Strategy Execution, Inc., a Virginia corporation.